Vale of Glamorgan Council brings the area’s past to life with new GPS triggered storytelling app. It’s designed to help visitors to the area uncover the myths and legends ingrained in its heritage. 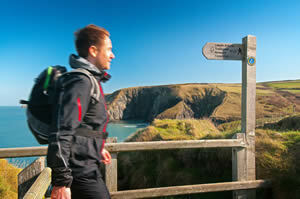 Tying in with Visit Wales’ Year of Legends and funded the app has been developed to promote Vale Trails, a series of five coastal and five inland walks in the area. With the aim of highlighting the county as a ‘must do’ walking destination, the app brings the stories, myths and legends of the Vale of Glamorgan to life along each of the 10 Vale Trails. Nia Hollins, principal tourism and marketing officer, said: “Walking in the Vale of Glamorgan combines a fascinating 60 kilometre stretch of the Wales Coast Path with the picturesque, historic beauty of inland Vale. The area is also steeped in history and there are a number of legends and myths that are ingrained in its heritage.